Say a prayer for Jan Kot, who I baptised yesterday in extremis, Jan was born prematurely at 29 weeks. His mother and father have been living in the hospital for the last month, pray for them they are exhausted by their vigil at the Cross. I have always been concerned about Catholics who seem to be able separate morality from the Eucharist. For me as a priest one of the most shocking things about the clergy abuse scandals was that here were men who were abusing children and then going to the altar to offer the Holy Sacrifice, one presumes without ever going to the sacrament of penance. One of my parishioners was convicted of fraud a few weeks ago, and is now serving a prison sentence, the fraud was ongoing, and the parishioner was a weekly communicant, and from time to time coming to week day Mass, obviously I don’t know if they frequented the sacrament of penance, but if they did I can’t see any sense of a firm purpose of amendment of life and certainly there was no attempt of making restitution to those who suffered because of his crimes. When I was a prison chaplain there was a Columbian drugs baron in “the Block”, a prison within the prison, who I used to avoid going to see because he was wanted Holy Communion but refused to accept responsibility for the actions of his crime, the easy option was to find some excuse for not bringing him Holy Communion, fortunately he was only there for a cauple of months. I remember a conversation with a priest, now a Bishop who told me, “… Communion is not a reward for good behaviour.” He was in a sense right but it does connected directly to how we live and if we are not living in communion with Christ and His Church then we should not receive Holy Communion. Today Cardinal O’Brien reminded Catholics, see below, that they can’t go to Holy Communion if they are in a state of serious sin and that involvement in abortion is a serious sin. But is not just abortion that is a serious sin, there is a whole gamut of serious sin that should prevent us from receiving Holy Communion. Cardinal O’Brien seems to be breaking ranks with UK bishops by suggesting that there might actually be something that prevents us from receiving Holy Communion and that there might actually be a group within the Church are in some sense less faithful than others. He is saying that there is a direct correlation between our actions and our interior relationship with Christ, and therefore with the Church. The message that we have been putting out in the past is that it is possible to have an amoral Catholicism. The idea of being in State of Grace seems to be a rather dated concept but sin and the sacraments do not mix. I remember having a discussion with the Cardinal ages ago in which he floated the idea that the sacrament of matrimony should not be given to those living together, in some parts of the world the sacrament of baptism is not given to a child whose parents are not married, because the assumption is that they are unable to pass on the Christian faith. Italian Bishops have told members of the Mafia they should not receive Holy Communion, in the past they said this about those who voted Communist. In the United States some bishops not only tell Catholics who support abortion that they should not come to Holy Communion but also tell priests that they should not give Holy Communion to those who should not present themselves for Holy Communion. How do we get over that Holy Communion is about living as a Christian and that our personal morality affects our relationship with Christ and how do we get over the fact our relationship with Christ is supposed to fruit in our personal morality? Besides meetin the McCann's the Pope also continued his Catechesis on the Fathers of the Church returning to Tertullian, the second century rigourist, who eventually became a heretic. –“Being with the Church and acceptance of its weaknesses” requires “humility” and “simplicity”, because “only God is truly holy, we are in need of His forgiveness”. The Pope made these observations today to over 40 thousand people gathered for the general audience in St Peter’s square, during reflections on the limitations of a great figure in Church history, Tertullian. Among the crowds were the parents of little Maddie, Madeleine Mc Cann the 4 year old English child, abducted May 3rd in Portugal. The Pope greeted the parents, Gerry and Kate briefly at the end of the audience; they hope this encounter will help them further inform public opinion about the event. Returning to “the line of great figures from the ancient Church, who still today are considered masters of the faith” Benedict XVI focused on the personality of Tertullian, the African apologist from the late II early III centuries, “the first great Christian author to write in Latin”, who communicates the positive essence of Christianity and illustrates its rational foundations. He underlined that Tertullian, is most famous for his apologetic writings, in which he aims to “counter grave pagan accusations against the Church” and “present positively the Gospel”, in dialogue with the culture of the time, but above all “denounce the un just behaviour of the political authorities of the time towards the Church, by explaining the Christian customs , illustrate the new religion” and show the triumph of the Spirit, which opposes the violence of the persecutors with the fact that “Christians blood is an effective seed, in the end their suffering will be victorious”. In fact, in a special way Tertullian exhorts Christians to have hope in those times of persecution, exalting hope not only as a virtue, but as “a characteristic which invests every aspect of Christian existence”. The Pope recalled that it was he who defined human nature as “naturaliter christiana” and maintained that “a Christian cannot hate, not even his own enemies” and that this is the moral repercussion of the choice of a faith which “proposes non violence as a way of life”. The Pope continued that from the human point of view, one can speak of a drama which plagued Tertullian: with the passing of the years he became ever more exigent of Christians: above all he expected them to face persecution heroically. In the end he found himself isolated: “an overly individualistic search for the truth along with his intemperance led to his breaking from communion with the Church to become a follower of the Montanist sect”. Still today “there is open debate regarding his behaviour”. “This great personality – commented the Pope – this figure so rigid in his convictions, who demanded Christians face persecution heroically, spurs me to thought. In the end it becomes clear that he lacked simplicity, the humility to become one with the Church, accepting its weaknesses”. When will an English Bishop say it as it is? EDINBURGH, Scotland (Catholic Online) – Catholic politicians must not cooperate in sustaining through legislation “the unspeakable crime of abortion” and to do so creates a barrier to their receiving holy Communion, says a Scottish cardinal on the approach of the 40th anniversary of passage of the law that made the taking of unborn human life legal. In a homily to be delivered May 31 at St. Mary’s Cathedral here on the Scottish Day for Life,” Cardinal Keith O’Brien, archbishop of Edinburgh and St. Andrews, decried the killing of about millions of unborn babies and the spreading of the “culture of death” throughout society. The Abortion Act 1967, passed by the British Parliament, made abortion legal in the United Kingdom for up to 28 weeks gestation. In 1990, the law was amended by the Human Fertilisation and Embryology Act: abortion became legal only up to 24 weeks except in cases where it was necessary to save the life of or there is grave risk of physical or mental injury to the mother or evidence of extreme fetal deformity. or there was a grave risk of physical or mental injury to the woman. The act does not extend to Northern Ireland, where abortion is only legal there if the life or the mental or physical health of the woman is at serious risk. “Around 7 million lives have been ended as a consequence of that one piece of legislation,” he says in the homily, posted on the Web site of the Scottish Catholic Bishops’ Conference. Society must build a culture that “joyfully accepts new life,” Cardinal O’Brien says. The Catholic community has a special responsibility to work against a “philosophy which permits the destruction of children in the haven of their mother’s womb,” he says. He points to his work campaigning on behalf of the developing world, against the possession of nuclear weapons and to protect “the most vulnerable and defenseless” in the womb as all acts in defense of life. “We must remain witnesses to the truth and be unambiguous in defending life in all that we do,” he says. Politicians, especially “those who claim to be Catholic,” must examine their consciences and determine whether they are helping in any way sustain “this social evil,” he said. “I remind them to avoid cooperating in the unspeakable crime of abortion and the barrier such cooperation erects to receiving holy Communion,” the cardinal warns, adding that “I would be failing as a pastor not to highlight the gravity of this situation not just to lawmakers but to anyone – mother, father, boyfriend, counselor who in any way leads a mother to abortion. He says that, beyond the outright banning of abortion, “there is much we can do,” including legislation aimed at reducing current abortion limits, ensuring parental notification for minors seeking an abortion and providing women considering the procedure full information about the physical and emotional risks to themselves and about fetal development. “We can work to ensure that the more light, which is shone on this terrible procedure the less acceptable it will be to our society,” he says. The Day of Life will be marked in Scotland's some 500 Catholic parishes, which have been sent 250,000 leaflets expanding on the day’s theme, “Blessed is the fruit of your women,” and explaining the Catholic Church's opposition to abortion. In a letter which accompanied the material sent to parishes, Archbishop Mario Conti of Glasgow urged "every parish in Scotland (to) take the opportunity to remind people that it is 40 years since the Abortion Act was passed into law" and encouraged parishioners to "pray for legislation to protect the unborn child from the moment of conception." - Pope Benedict XVI held the hands of the parents of 4-year-old Madeleine McCann, blessing them and a photo of the girl as they asked for prayers Wednesday for their daughter who disappeared while vacationing with her family in Portugal. The pope spoke with the parents, each dressed in dark suits, as he greeted dignitaries seated in the front row during his weekly general audience in St. Peter's Square. ``It was more personal than I ever could have imagined,'' said Gerry McCann, adding that Benedict immediately recognized Madeline's photograph. ``His touch and thoughts and words were more tender than we could have hoped and that will sustain us during this most difficult time,'' he said. The Vatican had readily accepted the British couple's request to meet with the pope, as they press their campaign to publicize their daughter's disappearance. Devout Catholics, they recently prayed at the pilgrimage site in Fatima, Portugal, for her safe return. The couple also outlined plans in the hunt for their daughter, saying they would travel to Spain, Germany and the Netherlands - countries that send many tourists to the holiday area in Portugal. Gerry McCann brought a poster of his missing daughter, which has been widely distributed, to the news conference at the residence of the British ambassador to the Vatican. He said the family was asking people going on holiday to put up the posters to further publicize the disappearance. He said he was grateful for the outpouring of solidarity. ``One evil act seems to be generating so much good,'' he said. A Vatican spokesman, the Rev. Ciro Benedettini, said British Cardinal Cormac Murphy-O'Connor had requested the McCanns' meeting with the pope. ``We are talking about a family drama that has touched world public opinion. It could not but touch the Holy Father, especially since these people are Catholics,'' Benedettini said. ``The Holy Father is considered the father of all, therefore he was personally touched as a father,'' the spokesman said. Madeleine McCann disappeared May 3 when her parents left her and her 2-year-old twin siblings alone in their hotel room while they went to a restaurant in their hotel complex in Praia da Luz, a resort town in Portugal's Algarve region. Gerry and Kate McCann have said they won't return to Britain without their daughter. Kate McCann is traveling with a pink stuffed animal - Cuddle Cat - that her daughter took to bed with her every night. ``We have no plans to go back to the UK at the moment. I can't even think about that now, to be honest,'' she said. Pray for Madeleine and all children who are kidnapped, especilly those tens of thousands abducted to be child soldiers in Africa. Scotland's University of Edinburgh, after proposing a ban on Bibles and denying a Christian campus group the right to hold a conference on the immorality of homosexuality, has extended the welcome mat to the school's Pagan Society to hold its annual meeting on campus next month. The pagan conference will feature presentations on a variety of topics, including Magic and Witchcraft in the 21st Century, Pagan Parenting, Pagan Marriage, Pagan Symbolism and Practice and Ancient Greek magic. A workshop in tribal dance will be held at the university Student's Association. "It will be an opportunity for people to listen to talks on various aspects of modern paganism and socialize with like-minded people in a relaxed, tolerant atmosphere," said John Macintyre, presiding officer of Pagan Federation Scotland. "Most people now recognize that the old stereotypes about witches and witchcraft are way off the mark and there is nothing remotely sinister about it." "Remotely sinister," it seems, is reserved for Christians at Edinburgh. In 2005, WND reported plans to begin banning Bibles from Edinburgh student halls of residence due to concern they are the source of discrimination against students of other faiths. The ban was a response to student association protests as well as an agenda to equally support all faiths, a university spokesman told the Times of London. While a Gideon Bible had traditionally been placed in the room of all new students, officials decided they could be offensive to some. Removal, advocates said, was about "respecting diversity," not attacking Christianity. The previous year, Edinburgh removed prayer from graduation ceremonies. The decision to allow the Pagan Society to hold its meeting on campus comes a year after university officials denied the same privilege to the university's Christian Union. "This seems to be a clear case of discrimination," said Matthew Tindale, a Christian Union staff worker. "It's okay for other religions, such as the pagans, to have their say at the university, but there appears to be a reluctance to allow Christians to do the same. All we are asking for is the tolerance that is afforded to other faiths and organizations." Simon Dames, spokesman for the Catholic Church in Scotland, called the university's action an example of "Christianphobia." "This appears to be a clear case of double standards," he said. "The principles of a pluralistic democracy revolve around an acceptance of competing ideas and universities should be enshrining this principle. Anti-racism groups would never be asked to put up posters saying there are alternative views." Pagan Macintyre has no sympathy for the Christians' appeal to fairness, stressing that followers of his faith are tolerant and support the university's equality policies . "Pagans, as a rule, don't believe that sexist or homophobic views are acceptable and discrimination on that basis is deplorable," he said. The Holy Spirit is Green! 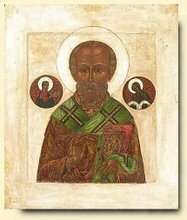 NLM has a piece on the use of the colour green in the Orthodox Church as a sign of the Holy Spirit and of Pentecost. I had always delighted in the Holy Spirit in the Rublev Trinity, being clothed in green, I had assumed it to be an insight peculiar to him. The pictures show Pentecost in an Orthodox Church. "Since Pentecost was originally a feast of harvest, as was mentioned above, the Jews used to decorate their homes with the fruits of the harvest—flowers, green foliage, garlands etc.—in order to add more pomp and solemnity to their celebrations. This same custom was also adopted by the Christians. To them, however, the green branches and flowers took on a symbolical meaning—the divine life and gifts of the Holy Spirit. There is the rather sad story of Pope Paul VI going to the sacristy to say Mass on the Monday after Pentecost, and seeing green vestments, he asked why the red vestments for the Mass of the Octave of Pentecost were not there. He was told, "But Holy Father, you signed a document abolishing it." Apparently he burst into tears. It does seem a shame we don't have an Octave now, The feast of the Holy Trinity seems to stand alone, a bit like a liturgical after thought, whereas in the past it was the Octave feast of Pentecost and the end of the cycle that began with Ash Wednesday. Fr Justin has an interesting piece on what Episcopal Ordination is. He addresses one of the problems of the theology of Vatican II. Trent sees a bishop who is a priest who is "unbound" to excercise the fullness of priesthood, but he is still a priest, where as Vatican II sees a Bishop as receiving additional powers, with the implication he is no longer a "mere" priest. It seems to suggest a disruption in Catholic thought which seems to destroy the very idea of development of doctrine, so it is actually a quite an important point, and one that isn't, for some reason discussed. With the descent of the Spirit on Mary and the apostles, the one, Holy, Catholic and Apostolic Church emerged. Benedict XVI adds that the Church is also missionary and “Roman”, in short “faithful to its origins” and capable of embracing all peoples. Musical bands from Northern Europe present in the square. Vatican City (AsiaNews) – In his address before the Regina Caeli prayer Benedict XVI gave a short catechesis on the nature of the Church, as is recited in the Credo, to the tens of thousands gathered in St Peters square. Reflecting on today's feast of Pentecost, which commemorates the descent of the the Holy Spirit on the Virgin Mary and the Apostles gathered in the Cenacle, the pope said this event marked “the solemn birth of the Church”. “In this extraordinary event – he continued – we find the essential and qualifying characteristics of the Church: the Church is one, as was the community of Pentecost gathered in prayer and 'agreement': ‘the community of believers was of one heart and mind' (Acts; 4,32). The Church is holy, not because of its own merits, but because it is animated by the Holy Spirit, it keeps its gaze fixed on Christ, so as to become one with Him and his love. The Church is Catholic, because the Gospel is destined for all peoples, thus from the very begining, the Holy Spirit makes it so it is announced in all tongues. The Church is apostolic, because it has been built upon the cornerstone of the Apostles, and is the faithful custodian of their teachings down through the unbroken line of episcopal succession”. Moreover, the “Catholic” characteristic of the Church, capable of reaching out to all peoples in all languages, also renders it “missionary”. “The Church – continued the pontiff – is in its very nature a missionary Church, and since the day of Pentecost the Holy Spirit has ceaselessly propelled it and continues to guide it along the world's paths, to the very edges of the earth and the end of all time”. The pope then added a further, “essential point”: the Church is also “Roman”, not in the context of geographical limitations, but as an expression of its catholic and missionary nature : “In the Acts of the Apostles - explained the pope - … the passage of the Gospel from the Jews to the pagans, from Jerusalem to Rome is described. Rome represents the pagan world, thus all of the nations of people who are beyond the circle of God's ancient people. In fact, the Acts conclude with the arrival of the Gospel in Rome. Thus we can say that Rome is synonymous of Catholicism and Mission, it expresses faithfulness to the origins, to the Church of all times, to a Church which speaks all languages and to all cultures”. Following the Marian prayer, Benedict XVI greeted the pilgrims in various languages, among them brass bands from Germany, Austria and Switzerland, who played some traditional German hymns. In order to understand Pentecost, the fifth week after Passover. Shavuot was the the Feast of Fiving of the Law, a riminder of the Jewish Creed, "My father was a wandering Aramean..." Deuteronomy 26:5, a wandering people in the desert, awaiting the fulfillment of God's promise. It was also the time when they remembered God's gifts in the desert the giving of the Law, and the fullfillment of the promise with the first harvest festival in Israel. Thus the importance of The Law no longer written on tablets of stone but on men's hearts. It seems to me that we have two fundamental rules.... The first was given to us by St Paul in his First Letter to the Thessalonians: do not extinguish charisms. If the Lord gives us new gifts we must be grateful, even if at times they may be inconvenient. And it is beautiful that without an initiative of the hierarchy but with an initiative from below, as people say, but which also truly comes from on High, that is, as a gift of the Holy Spirit, new forms of life are being born in the Church just as, moreover, they were born down the ages. At first, they were always inconvenient. Even St Francis was very inconvenient, and it was very hard for the Pope to give a final canonical form to a reality that by far exceeded legal norms. For St Francis, it was a very great sacrifice to let himself be lodged in this juridical framework, but in the end this gave rise to a reality that is still alive today and will live on in the future: it gives strength, as well as new elements, to the Church's life. I wish to say only this: Movements have been born in all the centuries. Even St Benedict at the outset was a Movement. They do not become part of the Church's life without suffering and difficulty. St Benedict himself had to correct the initial direction that monasticism was taking. Thus, in our century too, the Lord, the Holy Spirit, has given us new initiatives with new aspects of Christian life. Since they are lived by human people with their limitations, they also create difficulties. So the first rule is: do not extinguish Christian charisms; be grateful even if they are inconvenient. The second rule is: the Church is one; if Movements are truly gifts of the Holy Spirit, they belong to and serve the Church and in patient dialogue between Pastors and Movements, a fruitful form is born where these elements become edifying for the Church today and in the future. Now, as a synthesis of the two fundamental rules, I would say: gratitude, patience and also acceptance of the inevitable sufferings. In marriage too, there is always suffering and tension. Yet, the couple goes forward and thus true love matures. The same thing happens in the Church's communities: let us be patient together. Let us be grateful to the Holy Spirit for the gifts he has given to us. Let us be obedient to the voice of the Spirit, but also clear in integrating these elements into our life; lastly, this criterion serves the concrete Church and thus patiently, courageously and generously, the Lord will certainly guide and help us. Peter says, "they are not drunk for it is only the third hour." Acts of the Apostles 2:15. Amethyst, (a-methusko in Greek), means 'not to be intoxicated'. Therefore bishops wearing the traditional amethyst ring are stating they are successors of the Apostles. Just to horrify a Bishop or two, remember you get a partial indulgence from kissing a Bishop's ring, amethyst or not. In the midst of secularism and relativism, it is necessary to teach people that "Christ, the human face of God, is our true and only savior," says Benedict XVI. The Pope said this Thursday in an audience with participants at the 57th General Assembly of the Italian bishops' conference, who are holding a meeting in the Vatican on "Jesus Christ, the only Savior of the world: the Church in mission 'ad gentes' and among us." During the meeting with Italy's prelates, the Holy Father said: "I rejoice in the fact that you have placed at the basis of the missionary effort the fundamental truth that Jesus Christ is the only savior of the world. The certainty of this truth has given, from the beginning, a decisive impulse to the Christian mission. Today too, as the declaration 'Dominus Iesus' reaffirmed, we must be fully aware that from the mystery of Jesus Christ, true God and true man living and present in the Church, comes the unique salvific and universal nature of Christian revelation and, consequently, the essential task of announcing Jesus Christ to everyone." The answer Benedict XVI said that amid the challenges of the world today, God is necessary for everyone. "It seems to me," he said, "that, if we look at the situation of the world today, we can understand -- I would say in a human way, almost without having recourse to faith -- that God who gave himself a human face, the God who was incarnated, who is called Jesus Christ and suffered for us, this God is necessary for everyone, and the only answer to all of the challenges of this age." While giving "respect to other religions and cultures, with the seeds of truth and goodness they contain and that represent a preparation for the Gospel," the Pope continued, "we cannot diminish the awareness of the originality, fullness and unique nature of the revelation of the true God who in Christ was definitively given to us, nor can we diminish or weaken the Church's missionary vocation." "The cultural climate of relativism that surrounds us makes it more important and urgent" to instill in the Church "the certainty that Christ, the human face of God, is our true and only Savior," he affirmed. Fr Tim has a comment on this. The British composer John Taverner, whose works are inspired by religion, finished a piece based on Islam, which will be performed on June 19 in Westminster cathedral in London. The Beautiful Names (Los Nombres Hermosos) is the title of the work, which will be directed by the master Jiri Belohlavek with the BBC symphony and chorus in the opening ceremony, sources reported. "The Beautiful Names" refers to the 99 denominations of God according to the Islamic tradition and sung in Arabic, according to the author. The inspiration was "like a vision," said Taverner. For the closing ceremony, the musician counted had the close collaboration of the expert in Arabic issues Michael MacDonald, mainly to guarantee the pronunciation and the accent in that language. The 70 minute masterpiece is subdivided into 11 groups of nine "tonal areas" and each new section begins with a call to Allah. Forgive my skepticism but I think Iraq has made him one of the least able people in the world to do this. This is an intensely moving video of the journal of a father of child who dies shortly after birth, ti has appeared on various other blogs recently. Like a dog with a rat, I keep returning to this. However, I had never thought of this parish as be the centre or even the fringe of Liberalism. On the contrary it is pretty middle of the road. I know the clergy, they are certainly not liturgical radicals and would certainly be shocked to be thought so. But to me it seems as if we have lost contact with the very "idea" of Catholic liturgy, as being something we do in communion with the Universal Church, it happens everywhere in the UK, despite the fact that document after document reminds us that no bishop or priest can add, remove or change things in the liturgy. The more the Bishops "innovate", the more it will happen, their failure to pass on more than the vaguest whiff of the spirit of the Church's liturgical instruction the more the Catholic Church in this country will drift into its own very English little groove. It is amazing that we still do not have an English translation of the Enchirodon on Indulgences, or even the Book of Blessings, both the Roman Missal and the Book of the Gospels are apparently out of print, to say nothing of any approved set of hymn texts. I love our bishop's because they are successors of the Apostles but in matters liturgical they hardly have their finger on the button. Yesterday I had to go up to Guildford on the train to see my father, I had the chance to start to read the Pope's book, there he talks, in the context of the temptations, of the biblical and patristic idea of "forty". Forty days in the wilderness representing the forty years of Israel wandering in the desert. Four, the idea of perfection multiplied by ten the number of commandments or words by which God reveals himself. I thought that the idea of forty days of fasting in Lent corresponding to the forty day of feasting from Easter until Ascension, sad we have lost this numerical stuff, it introduces us to "cosmic time"which the Pope talks a lot about in "Spirit of the Liturgy". It negates the idea of the Church, or the faithful if you will, actually be in the desert, the wilderness, in the upper room, as a Jew would understand their celebration of the feast especially Passover as being a real and actual "re-presentation", not "representation", of the biblical event, in which time and space are transcended. Would readers kindly say a prayer for my father who is quite sick. I was very struck by this picture on NLM, unfortunately there is no link, so I do not where it comes from, anyone know ? It is obviously the Dominican Rite somewhere, presumably, from the fleur de lis, in France. What I thought was interesting was that this is a modern sanctuary in what looks like an ancient setting. Americans have the term "wreckovation" for modernising, but this really does not seem to be that, on the contrary, the lack of fussiness gives the impression of something that is remarkably elegant, an expression of "noble simplicity". Does anyone know of an architect in the southeast of England who could help us re-order our Church? Really it is a restoration job, putting right what was mucked up in the 70s, moving fonts and the altar. We started thinking about it a few years ago, I lost patience with our diocesan art and architecture committee who wanted us to put in ramps and hand rails, to replace steps; ramps would have to have a length of 12ft for a rise of one foot, absolutely mad! I have also been putting off doing something, in the expectation of the promised documents from Rome on the liturgy. Presumably the M.P., which is "imminent" will affect the interior of our churches, so both "usages" of the Roman Rite can be celebrated. We need an architect who will be sensitive to the Victorian interior and yet have some imagination with the interior decoration, lighting, flooring and so forth. If you know of someone who has a proven track record of good quality work, and who can work on the pittance we can afford, let me know. In England we really don't seem to have architects who actually understand the liturgy. Similarly, if there is anyone with vast quantities of money, we would be very grateful for that as well. Here's more evidence that the tide of popular opinion is turning against the abortion free for all in Britain. A UK doctor was asked for an abortion by a woman 28 weeks pregnant. He refused. (the law in the UK allows abortion up to 24 weeks) When she returned a few weeks later he saw that she was no longer pregnant. She said, 'I had it sorted out privately.' The doctor suspects she went to BPAS (British Pregnancy Advisory Service) which is a private abortion mill and has called in the police. (CNA).- Thousands of pilgrims flocked to St. Peter's square to hear the Pope's first public address since his trip to Brazil last week. Benedict speech was filled with relevant topics—his trip to Brazil, the annual World Day of Social Communications, and the celebration of the Ascension. The Holy Father wasted no time in mentioning his desire to "renew my thanksgiving to the Lord for the apostolic trip to Brazil." He also added his thanks to "those who accompanied me with their prayer." The Pope then reminded everybody that "the reason for my pastoral visit . . . was the inauguration of the Fifth General Conference of the Latin American and Caribbean Bishops." However, "before this great ecclesiastical event, I had the chance to meet with the Brazilian Catholic community. "Recalling this great event brought to the Holy Father’s mind how many people came to "the canonization of the first native of Brazil, Br. Antonio di Sant'Anna Galvao.
" He then invited all present "to continue to pray for the Conference . . . and for God's people who live in Latin America. "Benedict then changed the topic of his address to "the annual World Day of Social Communications," whose theme this year is, "Children and Means of Communication: an Educational Challenge." Because the mass media is becoming so pervasive, "an adequate formation in the correct use of the media is essential." In fact, "parents, teachers and the Church community are all called to work together to educate children to be selective and to develop a critical attitude (of the media’s messages). "The Pope also noted the positive impact that the media can have when it is used correctly. "The media must bring their contribution to this educational task, promoting the dignity of the human person, marriage and the family." Benedict clearly stated that programs that teach "violence and anti-social behavior or vulgarize human sexuality are unacceptable, even more so when presented to minors." Once again, Benedict "renewed the call to those responsible for the media industry . . . to safeguard the common good, respect the truth, and protect the dignity of the person and the family. "His Holiness closed the address by drawing attention to the fact that the Ascension is celebrated in some countries today, and that "the Risen Jesus returns to the Father, thereby opening to us the way to eternal life and making the gift of the Holy Spirit possible." Therefore, "like the Apostles did after the Ascension, we also should come together in prayer to invoke the Spirit, in spiritual union with the Virgin Mary." Pope Benedict XVI yesterday called for an end to the violence between Israelis and Palestinians, and between Palestinian factions. that has escalated in the last few days. The Pope made the appeal after praying the Angelus with pilgrims in St Peter's Square ­ hours after Israel announced plans to intensify operations against Palestinian militants in Gaza. Israel and militants within Gaza have been exchanging fire for the last week. Israel has carried out airstrikes against Hamas targets in Gaza for five days, leaving more than 30 many civilians dead and dozens injured. Palestinian militants have launched more than 100 rockets into Israel. So far there have been no Israeli casualties but considerable damage to property. Fighting between the rival Hamas and Fatah movements in Gaza killed at least 50 people in the past week. A truce was called on Saturday. The Holy Father said: "The fighting between Palestinian factions in the Gaza Strip and the rocket attacks against the inhabitants of nearby Israeli cities, which have provoked military intervention, are bringing about a bloody deterioration of the situation and causing dismay. "Once again, in the name of God, I ask that an end be brought to this tragic violence, while to the suffering Palestinian and Israeli populations I desire to express my solidarity and assurance of my prayerful remembrance. "I appeal to the sense of responsibility of all the Palestinian authorities that, in dialogue and firmness, they take up again the difficult path of understanding, neutralizing the violent. "I invite the Israeli government to moderation and exhort the international community to multiply efforts for the relaunching of negotiations. "May the Lord bring forth and sustain makers of peace!" Having been the first priest in this parish to have celebrated Ascension Day on a Sunday since Mass was first celebrated here in Saxon times, I am still unhappy about it. Judging from the amount of money in the Bishop's Conference collection for the Mass Media Apostolate I suspect my people are unhappy about it as well. There is something abot todays feast especially that touches on time; Christ passing from time to being beyond time which is one reason for scripture stating the exact time of the year on which this event took place. I noticed a comment on someone's blog saying that they wanted to start a campaign for the restoration of the 7th Sunday of Easter. I really do think that when something as drastic as a change in the calendar takes place some type of catechetical material needs to be produced. Lawrence, one of our parishioners, wants to become a professional gardener, he is doing a course at the moment. Very kindly he has offered to do something with our tiny little plot, actually for Brighton it is quite big, I'll put some pictures up eventually. In the past it was somewhere for the maid used to hang out the laundry. Then, one of my predecessors had a butler, a cook and three or four other staff, since then the kitchen has been moved out of the basement, laundry gets hung up in the old scullery and the old kitchen is now an office for an ecumenical project for refugees, Brighton Voices in Exile. Anyhow Lawrence is at this moments digging up the weeds which passed for a lawn. Lawrence has his own blog spot, so if you are in or around Brighton and want some gardening done contact him, I think he charges about £12 an hour, a sixth of what I paid a plumber just to visit last week. His email address is on his blog. What is your favourite image of Our Lady? What is your favourite Marian feast? What is your favourite Marian hymn/anthem? What is your favourite Marian place of pilgrimage? What is your favourite Marian devotion? This my favourite Marian image, it is a 19th cent icon of Our Lady Kazan, I have it memory of my mother, it combines majesty and tenderness. I love Salve Regina, especially the solemn tone, the tone seems to combine certainty and a degree of diffidence, and ends with confidence with "O Pia ...."
The Assumption when I was a protestant was the most difficult for me to understand, but it is all about us following Christ, even into Heaven. It stretches the mind and heart. Walsingham is beautiful, so English, especially when it is quiet. I love Marian processions especially in Spain or Malta. Oh dear tagged twice, or maybe even more often, but I have seen my name on Mac’s and now Joee’s blogs: what are my five favourite Catholic places in England. I am tempted to be smart and just do pictures of my sitting room, kitchen, church, Brighton beach, and my confessional or a friend’s or parishioner’s house, or just a list of former parishes. I remember as a precocious six year old being asked what my favourite colour was by Mrs Baldock, when I asked “For what, for shoes or dogs or wallpaper?” I was made to stand with nose pressed against a blackboard. I developed a deep hatred of Mrs Baldock in that half hour, for which I still think I need counselling, endless counselling. Not having a car means I tend not to go to the odder places in the country. I have affection for people not really for places, but let’s try to be honest. I really do love my sitting room, it has pictures and mementoes of people who are precious to me in it, as well as instruments and music, books and icons. It is the place I pray in. I have this thing about the ancient monastic Fathers who warn about wandering about, it is the place where I centre myself. Quarr is another place I love, my previous Bishop, now Cardinal Murphy O’Connor let me go and try my vocation there, Abbot Cuthbert and the community showed me great kindness. Whenever I go there I want to stay and at the same time, …well I haven’t been there since I left. It was also the place where the Cardinal showed me the greatest kindness I think anyone has ever shown me. He just came on retreat there and spent time with me, saying little, a simple thing but an extra-ordinary act of generosity and graciousness, so characteristic of him. A lesson in how a Bishop is a also a Father. The tomb of Edward the Confessor, which I consider is still Catholic, as it is occupied by a Catholic, in Westminster Abbey I love, it sums up English Catholicism for me, I have always wanted to say Mass there. Minster Abbey, again I haven’t been there for aeons, they have tiny little chapel which I think is 11/12 cent, originally a gatehouse, I used to take our confirmation group there, there are eminently sensible nuns there. St Joseph’s Church, Guildford (now demolished and replaced) it was where I first encountered the faith and Catholics, and where I learnt to pray from a master of prayer called Fred. He was the sacristan and just used to sit in the Church before the Blessed Sacrament, for hours. I tag Orthfully Catholic, Fr Justin, Ttony and Fr Dwight Longenecker, who used to live in Bexhill-on-Sea, if they haven't already been done -but not Mrs Baldock - but you don't really have to do this and I am not going to put this on your blog, so you can ignore it if you like! One serious pastoral problem we have, which undermines an important part of Christ's teaching, is that many people seem to come Holy Communion who shouldn't, as well as those who should come to Holy Communion but do not. The reason for many is that they are married outside the Church, either in a civil ceremony or on some beech in the Caribbean, or for some reason in a non-Catholic ecclesial community or church. Sometimes it is that they just cannot afford the ceremony; actually the ceremony costs less than £200 in most Catholic Churches, including the fees for an organist, registrar and a small gratuity to the priest. The extras, the frock, the party are the things that cost money, and often lead people into serious debt. I have often though we need a cheaper alternative. Call me an old unreconstructed 1970s liberal, if you must, but I also think that one of the problems with weddings is that they lack any connection with the parish community, although they take place in a public building, they are actually private occasions. I was struck by the post below from Dappled Things, I would be very interested to know what you think, to me this celebration seems to be a good way of teaching about the value of marriage and avoids a convalidation -- which is really a putting right of something which is wrong - in the past they were conducted in the sacristy or a side chapel -- becoming a repudiation of the previous non-sacramental ceremony, which is another reason why people avoid putting a marriage right. ......I contrast that to the weddings that we celebrated last Saturday night in the Spanish Vigil Mass. Twice a year, we encourage couples who are in merely civil unions or long-term cohabitation to take advantage of a program I started up a few years ago. We take these couples, most of whom have children and are together for several years, and who for whatever reason didn't seek the sacrament of matrimony when they got together. They hear it advertised at Mass, so almost all of them are regular Mass-goers, but obviously unable to receive Holy Communion or to fill leadership roles in the parish. Two married couples and I give them marriage talks, meet with them, put together their paperwork, and make sure there are no obstacles to solemnizing their marriages. Then, together with the people with whom they've taken the classes, they make their vows in the parish Mass, surrounded by fellow parishioners who've been praying for them while they've prepared. The parish pays for the music, pays for the decorations, and doesn't charge a dime. And they return to the Sacraments that night at the same time they receive the convalidation of their marriages. The week afterward, we always get a deluge of phone calls of people who were moved by the beautiful and festive celebration and want to have their own unions blessed in the same way, as well. The event is palpably sacred, the newlyweds end up becoming some of our most active parishioners, and the communal nature of the Sacrament is made patently obvious. There's no fretting over trivial details. There's no obscene expenditure of money. There's no worrying over guest lists, as all are welcome. Even though validation isn't the best way to go -- that is, being married in the Church after a civil ceremony or concubinage -- these group weddings are my favorites, and the couples tend to be the ones who impress me most. I've also been edified by the way our parishioners look forward to them each season and the interest and joy they show in the couples. It really is a celebration within the parish community, and not merely a private ceremony attended by people one has never seen before. To that extent, the joy of the event seems several orders greater, as well. I rather like this pastoral intiative, I would be grateful for comments. This is the first of a couple of videos and an article on Moromonism on Roman Catholic Blog. My question why do people believe this stuff? Just a snip, Sandy, one of my parishioners who is doing a thesis on Catholic Education in Brighton in the 19th Century, told me that Cardinal Manning preached here and stirred the Protestant Defense Association to call our Church, "Satan's Synagogue". St John the Baptist the first Church in Brighton opened in 1835 was made to look like Palladian fronted Assembly Room, by the 1860's, the heirarchy having been re-established in 1850, the parish priest decided we have the highest spire in the town and built something quite obviously a Church. Manning apparently preached on the Truths of Catholicism, the sermon was reported in the press, provoking this outburst in a pamphlet. The PDA was particularly strong in Brighton, a generally reacted against the excessive ritualism of the C of E in the town, where south coast religion was significantly "up the candle". I am tempted to use "Satan's Synagogue" on our letter head. The Mother of all Novena’s and the scriptural basis for this type of devotion begins tomorrow. The nine days that precede Pentecost, when the pious spiritually join themselves with the Great Mother of God and Apostles in ardent prayer, and meditation on the Life of the Lord, before the Coming of the Holy Spirit begin tomorrow, in Rome it will celebrated as the Ascension of Our Lord Jesus Christ, in Jerusalem it will be celebrated as that, even the Church of England will celebrate it as that, when I was a little Protestant boy, at a Protestant school, we actually had the day off after going to Church, only time in the Year it happened. What is more The BBC, which some regard Catholics seem to regard as anti-Christ, will actually have a service on mainstream radio, not sidelined to Radio 3, Thought for the Day will be on it! I even know of Baptist Churches that will keep it as a Holy Day, because it has a Scriptural dating; Nine days before Pentecost. We Catholics, however, subject to the rule of the Episcopal Conference of England Wales, for the first time, since Augustine brought the flame of faith to these benighted shores, will not celebrate this great feast on this day. Whilst Mass is celebrated as feria the voices of our school children will be heard, not in the Church but in the school playground outside the Church, will they be there on Sunday? No, the majority will not be. The Polish community, I think are using the Church tomorrow night, and I know that one or two priests who celebrate the Traditional Rite, will be celebrating that tomorrow and therefore having two Ascension Days. I can take other Holy Days being transferred to the Sunday but this day above all is linked directly to these nine days before Pentecost. Forty years ago in the interest of something Pentecost was stripped of its Vigil -- quite like the Easter Vigil-- and then of its Octave, now it has been stripped of its period of preparation. One blogger suggested that all Catholics should make an effort to attend Mass at there diocesan Cathedral tomorrow, there is something very, very distasteful about using Mass to protest about anything but going to Mass to begin the Novena and to say the “Come Holy Spirit” would be a good thing. In July there is going to be a smoking ban in England and Wales in public places. "The people at the Ministry" are insisting on Churches putting up notices in Churches, Mosques etc. We are an old-established firm of ecclesiastical sign makers and we would like to offer you our services now that the Government has told cathedrals and churches that they must put up No Smoking signs by July 1st. We are well qualified to fulfil your needs and our motto, taken from the gospel of St Matthew, is: "An evil and adulterous generation seeketh after a sign." Business, as you can imagine, is booming. We can do the standard notices, such as "Thou Shalt Not Smoke," or "This Font is Not an Ashtray" and "Blessed are the Non-Smokers". These come in a number of sizes, ranging from "side chapel" to our jumbo-sized "York Minster". We enclose a chart showing the varieties of lettering we can offer. Anti-smoking signs are tailored to the individual needs of the place of worship. Our production methods are geared to both High Church and Low Church (high tar and low tar) requirements. We also have "Smoking is Strictly Forbidden in the Confessionals" notices which are going down very well with the Roman Catholic dioceses. Many discerning bishops are now choosing one of our stained glass windows to get the anti-smoking message across. Our craftsmen can do you a wonderfully colourful east window depicting St Jeremy Casting Out the Inhaling Ones. We also have the poignant Torments of St Bensona of Hedges in which she suffered 40 days and 40 nights of withdrawal symptoms after an angel told her to forsake her 30-a-day habit. 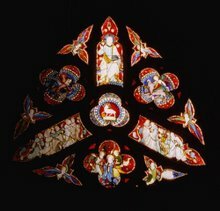 Or you may prefer our highly dramatic window showing God Sending a Mighty Wind to Extinguish the Flame of Satan's Zippo. An illuminated text can do wonders to enhance Norman architecture. A village church in Norfolk has just put up this quotation from St Matthew which we prepared specially for the parish: "Why beholdest thou the Marlboro Light that is in thy brother's mouth, but considerest not the slim panatella that is in thine own mouth?" The vicar tells us that this has cut down smoking incidents at Evensong by 15 per cent. This text is also available in the New English Translation version - "It is counter-productive to be judgmental about your brother who relaxes with the occasional cigarette when you yourself have just enjoyed a crafty small cigar". We are also proposing to bring out a text saying: "It is easier for a rich man to pass through the eye of a needle than for a smoker of Camels to enter the kingdom of heaven." Many clergymen are also finding that audio-visual aids can be useful. Let our experts visit your place of worship to see if we can install our clap-of-thunder and flash-of-lightning feature which is triggered by a smoke alarm every time somebody goes behind a pillar for a quick drag. We also rig up speakers so that a deep booming voice (Tom Baker, actually) delivers the anti-smoking message from the rafters. We can do: "If you wish to smoke, please go into outer darkness." Also: "Smokers will be forgiven" and "I can always see what you're doing". If you order three passive smoking saints we will send you 10 free signs saying: "This way to the Giving Up Smoking Workshop in the Crypt". You may be thinking of a non-threatening humorous approach. We can help you there, with our sign which says: "When the floor of the apse is full, please use the ashtrays provided." Finally, discretion is assured if you order from our special "Schism" range of signs. You will receive, by post and under plain cover, the one which says: "Smoking is not permitted in this church. See, that's what you get when you let in women priests." I have just been looking at Joee's blog, I must say I don't have much devotion to this modern saint. He has always struck me as a bit like a spiritual accountant. I know that he has had a profound effect on the lives of many men and women. I cannot help thinking I would have disliked him if I had known him personally. I have some of his books that I have been meaning to read for ages and really cannot bring myself to start. I say all this to my shame because I actually find those who follow the Way and involved in the Work quite impressive. I thought those of you who share my feelings might find this video, which has an interview with Bishop Alvaro del Portillo, helpful. You see, we have an obligation to love those God loves, be it Spanish saints or even ourselves. Pope in the Farm of Hope! Pope Benedict XVI during his visit at 'Fazenda da Esperanca' or 'Farm of Hope' drug rehabilitation center in Guaratingueta, Brazil, Saturday. The essential message of the Pope during the Brazilian visit, and during his Papacy, has been that Christ alone is our hope. Everything he does seems to have a symbolic meaning, he is above a Liturgist. His visit to the Fazenda seemed to be a sermon in itself, it took up quite a considerable amount of time in his visit. This community was set up a Fransican friar, it is able to boast an almost 80 per cent success rate in getting people off drugs, through catechesis, prayer and work, and it seems through formation in ascetiscism. At the opening of CELAM the pope had said drug addiction was a consequence of the hopeless consumerism of capitalism, (see Zenit for the whole text), here he seems to be saying that this type of new community is the source of hope for the Church itself. I am sure that he will talk about this in his Wednesday audience. Doctors at a hospital popular with celebrity mothers will this week rebel against a proposed ban on providing contraceptives and abortion referrals and demand that Britain's most senior Catholic cleric step down as its patron.Staff at the Hospital of St John & St Elizabeth in north London, where actresses including Cate Blanchett and Emma Thompson and models such as Kate Moss and Heather Mills have given birth, are unhappy at a suggested new code of ethics which will prevent them offering any service that conflicts with Catholic teaching on the value of human rights. The code will require doctors to refer any woman who inquires about contraception, the morning-after pill and abortion to another hospital and prevent the use of amniocentesis to detect Down's syndrome in unborn children and in vitro fertilisation for couples unable to conceive naturally. On Wednesday, the hospital's medical advisory committee will tell the hospital board that opposition to the proposed rules from staff and resident GPs is overwhelming. It will suggest that a "secular" code of ethics be adopted instead and call for Cardinal Cormac Murphy-O'Connor to resign as patron. Dr Martin Scurr, the chairman of the hospital's ethics committee, has already informed board members of the advisory committee's position. In a letter, he told them: "It is to be anticipated that the Cardinal will withdraw his patronage from the hospital. "The hospital will continue as a non-Catholic hospital, with a Catholic heritage, and a new ethics committee will subsequently be formed which must evolve a code of ethics which is acceptable to the secular cadre of clinicians of the hospital, in alignment with the jurisdiction of the General Medical Council." A lot depends, of course, on the Trust Deeds, which actually bind the Hospital to the Church. But this however seems to be yet another of those institutions like our adoption agencies, our schools, the former CIIR, Cafod, etc. etc., you can add to the list yourself if you like, of "Catholic" institutions that in trying to come to terms with modern secular society are distancing themselves from being real parts of the Church and its mission, and merely hanging on to their Catholic heritage or depending a bankrupt and misplaced Catholic ethos. To paraphrase the Pope in Brazil: it is either Mission or Die! Nova et Vetera has just been started, and as Father Justin has graciously "hat tipped" me, in one of his first posts, I return the compliment and commend his blog to you. Is there a blessing for new blogs? Anyhow let us ask St Isidore, the patron of computronomy (new word) to sought out graces for it. Fr Zuhlsdorf has a very interesting round up of the Italian papers reaction to the Popes Sao Paulo Address entitle "Benedict beats Brother Bishops Black n Blue", have a look. Read Amy Welbourne's take as well, she also has some background information on the drug rehabilitation community that he is visiting today, it seems as if this is the positive side of his message, a place where the poor hear the Gospel and have their lives changed and hope restored. I can't help feeling that the Holy Father's Address to the Bishops of Brazil, at Vespers in Sao Paulo, is something that is really addressed to all the world's Bishops. Below I have put several quotes on particular aspects of his address. Not even the setting (the beautiful and vast Metropolitan Cathedral of São Paulo), the music (some tasteful polyphonic pieces and an aesthetically deficient, yet dignified, use of plainchant for the psalms and hymns of Vespers -- unfortunately, in the vernacular), nor the overall attentive mood of those who were present at the event could possibly have prepared the largest episcopate in the world for the remarkable speech of the Holy Father to the Bishops of Brazil.The Holy Father delivered a precise diagnosis of the deep crisis of the Catholic Church in Brazil - extensive to many other nations: all important topics were covered by the Pope, from liturgical disobedience to attentiveness to the sexual maturity of seminarians, from a condemnation of the use of the Church as a field for ideological confrontation to the need to be clear in all ecumenical settings that the only Church of Christ subsists in the Catholic Church presided by the Successor of Peter.In our modest opinion, this remarkable speech (in English - called a "homily" in the Official Program, due to its liturgical setting, but not particularly homiletic) is one of the most important of the Pontificate, along with the Christmas Address of 2005 and the Regensburg Address of 2006. The true question is, however: will the bishops of the world understand and take heed of this Papal reprimand? I think that it is significant that the Pope stresses that the main reason for the Brazil trip, is to be present at the opening of CELAM, the bishops of Latin America and the Carribaen's ten yearly meeting. It seems, almost, that he is trying to catechise the Bishops. A friend of mine, said that his Wednesday Audience addresses were mainly aimed at the Roman Curia and clergy living in the city and it seems to me that he is trying to get the Bishops to take their rightful place in the government of the Church but that he can only do this if they understand their role as "present day Apostles" and take that role seriously. .....Although he was Son, he learned obedience through what he suffered; and being made perfect he became the source of eternal salvation to all who obey him" (Hebrews 5:8-9). Filled with meaning, these verses speak of God's compassion for us, as expressed in the passion of his Son. They speak of Christ's obedience and his free, conscious acceptance of the Father's plan, which appears most clearly in his prayer on the Mount of Olives: "Not my will, but yours, be done" (Luke 22:42). Jesus himself teaches us that the true way of salvation lies in conforming our will to the will of God. This is what we pray for in the third petition of the "Our Father": that God's will be done on earth as it is in heaven, since wherever God's will reigns, there the Kingdom of God is present. Jesus attracts us by his will, his filial will, and so he leads us to salvation. By freely accepting the will of God, in union with Jesus Christ, we open the world to God's Kingdom. We Bishops have come together to manifest this central truth, since we are directly bound to Christ, the Good Shepherd. The mission entrusted to us as teachers of the faith consists in recalling, in the words of the Apostle of the Gentiles, that our Saviour "desires all men to be saved and to come to the knowledge of the truth" (1 Timothy 2:4). This, and nothing else, is the purpose of the Church: the salvation of individual souls. For this reason the Father sent his Son, and in the Lord's own words transmitted to us in the Gospel of Saint John, "as the Father has sent me, even so I send you" (John 20:21). Hence the mandate to preach the Gospel: "Go therefore and make disciples of all nations, baptizing them in the name of the Father and of the Son and of the Holy Spirit, teaching them to observe all that I have commanded you; and lo, I am with you always, to the close of the age" (Matthew 28:19-20). These words are simple yet sublime; they speak of our duty to proclaim the truth of the faith, the urgent need for the sacramental life, and the promise of Christ's continual assistance to his Church. These are fundamental realities: they speak of instructing people in the faith and in Christian morality, and of celebrating the sacraments. Wherever God and his will are unknown, wherever faith in Jesus Christ and in his sacramental presence is lacking, the essential element for the solution of pressing social and political problems is also missing. Fidelity to the primacy of God and of his will, known and lived in communion with Jesus Christ, is the essential gift that we Bishops and priests must offer to our people (cf. "Populorum Progressio," 21). 3. Our ministry as Bishops thus impels us to discern God's saving will and to devise a pastoral plan capable of training God's People to recognize and embrace transcendent values, in fidelity to the Lord and to the Gospel. Certainly the present is a difficult time for the Church, and many of her children are experiencing difficulty. Society is experiencing moments of worrying disorientation. The sanctity of marriage and the family are attacked with impunity, as concessions are made to forms of pressure which have a harmful effect on legislative processes; crimes against life are justified in the name of individual freedom and rights; attacks are made on the dignity of the human person; the plague of divorce and extra-marital unions is increasingly widespread. Even more: when, within the Church herself, people start to question the value of the priestly commitment as a total entrustment to God through apostolic celibacy and as a total openness to the service of souls, and preference is given to ideological, political and even party issues, the structure of total consecration to God begins to lose its deepest meaning. How can we not be deeply saddened by this? But be confident: the Church is holy and imperishable (cf. Ephesians 5:27). As Saint Augustine said: "The Church will be shaken if its foundation is shaken; but will Christ be shaken? Since Christ cannot be shaken, the Church will remain firmly established to the end of time" ("Enarrationes in Psalmos," 103,2,5: PL 37,1353). A particular problem which you face as Pastors is surely the issue of those Catholics who have abandoned the life of the Church. It seems clear that the principal cause of this problem is to be found in the lack of an evangelization completely centered on Christ and his Church. Those who are most vulnerable to the aggressive proselytizing of sects -- a just cause for concern -- and those who are incapable of resisting the onslaught of agnosticism, relativism and secularization are generally the baptized who remain insufficiently evangelized; they are easily influenced because their faith is weak, confused, easily shaken and naive, despite their innate religiosity. In the Encyclical "Deus Caritas Est," I stated that "being Christian is not the result of an ethical choice or a lofty idea, but the encounter with an event, a person, which gives life a new horizon and a decisive direction" (No. 1). Consequently, there is a need to engage in apostolic activity as a true mission in the midst of the flock that is constituted by the Church in Brazil, and to promote on every level a methodical evangelization aimed at personal and communal fidelity to Christ. No effort should be spared in seeking out those Catholics who have fallen away and those who know little or nothing of Jesus Christ, by implementing a pastoral plan which welcomes them and helps them realize that the Church is a privileged place of encounter with God, and also through a continuing process of catechesis. The sacramental life, especially in the celebration of Confession and the Eucharist, here takes on a particular importance. As Pastors, it is your primary task to ensure that the faithful share in the eucharistic life and in the Sacrament of Reconciliation. You must be vigilant to ensure that the confession and absolution of sins is ordinarily individual, inasmuch as sin itself is something profoundly personal (cf. Post-Synodal Apostolic Exhortation "Reconciliatio et Paenitentia," 31, III). Only physical or moral impossibility exempts the faithful from this form of confession, in which case reconciliation can be obtained by some other means (cf. Code of Canon Law, can. 960, Compendium of the Catechism of the Catholic Church, 311). It is appropriate, therefore, to instil in priests the practice of generously making themselves available to the faithful who have recourse to the sacrament of God's mercy (cf. Apostolic Letter "Misericordia Dei," 2). 4. Starting afresh from Christ in every area of missionary activity; rediscovering in Jesus the love and salvation given to us by the Father through the Holy Spirit: this is the substance and lifeline of the episcopal mission which makes the Bishop the person primarily responsible for catechesis in his diocese. Indeed, it falls ultimately to him to direct catechesis, surrounding himself with competent and trustworthy co-workers. It is therefore clear that the catechist's task is not simply to communicate faith-experiences; rather -- under the guidance of the Pastor -- it is to be an authentic herald of revealed truths. Faith is a journey led by the Holy Spirit which can be summed up in two words: conversion and discipleship. In the Christian tradition, these two key words clearly indicate that faith in Christ implies a way of living based on the twofold command to love God and neighbour -- and they also express life's social dimension. Truth presupposes a clear understanding of Jesus' message transmitted by means of an intelligible, inculturated language, which must nevertheless remain faithful to the Gospel's intent. At this time, there is an urgent need for an adequate knowledge of the faith as it is presented in the Catechism of the Catholic Church and its accompanying Compendium. Education in Christian personal and social virtues is also an essential part of catechesis, as is education in social responsibility. Precisely because faith, life, and the celebration of the sacred liturgy -- the source of faith and life -- are inseparable, there is need for a more correct implementation of the liturgical principles as indicated by the Second Vatican Council, as well as those contained in the Directory for the Pastoral Ministry of Bishops (cf. 145-151), so as to restore to the liturgy its sacred character. It was with this end in view that my Venerable Predecessor on the Chair of Peter, John Paul II, wished "to appeal urgently that the liturgical norms for the celebration of the Eucharist be observed with great fidelity ... Liturgy is never anyone's private property, be it of the celebrant or of the community in which the mysteries are celebrated" (Encyclical Letter "Ecclesia de Eucharistia," 52). For Bishops, who are the "moderators of the Church's liturgical life", the rediscovery and appreciation of obedience to liturgical norms is a form of witness to the one, universal Church, that presides in charity. As you know, among the various documents dealing with Christian unity, there is the Directory for Ecumenism published by the Pontifical Council for Promoting Christian Unity. Ecumenism -- or the search for unity among Christians -- has become in our time an increasingly urgent task for the Catholic Church, as is evident from the growth of intercultural exchange and the challenge of secularism. Consequently, given the rapidly growing number of new Christian denominations, and especially certain forms of often aggressive proselytism, the work of ecumenism has become more complex. In this context, a good historical and doctrinal formation is absolutely essential, so as to foster necessary discernment and lead to a better understanding of the specific identity of each of these communities, the elements that divide them, and those elements that can be helpful on the road to greater unity. The greatest area of common ground for collaboration should be the defence of fundamental moral values -- transmitted by the biblical tradition -- against the relativistic and consumerist cultural forces that seek to destroy them. Another such area is faith in God the Creator and in Jesus Christ his incarnate Son. Moreover, there will always be the principle of fraternal love and the search for mutual understanding and rapprochement. Yet we must also be concerned with defending the faith of our people, confirming them in the joyful certitude that "unica Christi Ecclesia … subsistit in Ecclesia catholica, a successore Petri et Episcopis in eius communione gubernata" ["The one Church of Christ … subsists in the Catholic Church which is governed by the successor of Peter and by the Bishops in communion with him"] ("Lumen Gentium," 8).